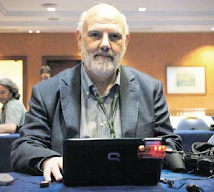 Edward Hugh is only able to update this blog from time to time, but he does run a lively Twitter account with plenty of Italy related comment. He also maintains a collection of constantly updated Italy economy charts together with short text updates on a Storify dedicated page Italy - Lost in Stagnation? "Italy is now on course to become quite literally the oldest of countries. Beset by economic and social stagnation that makes it among the most ossified slices of Old Europe, it is stuck with a stubbornly low birth-rate that means Italians are not even replacing themselves. In a more fundamental way, the nation has not figured out how to make use of the energy and ingenuity of its young. Faced with bleak job prospects and a lack of young leaders to look to, Italians in their 20s and 30s risk falling into a nationwide generational rut. Many are afflicted with a pervading sense of hopelessness and malaise that contrasts with the youth-driven vigor boosting states like Sweden or Slovenia." At the core of the dilemma lies Italy's aging but long-lived population. For the past generation, the birthrate has remained at or near the bottom of world rankings, stuck last year at 1.3 children per woman (compared to 2.7 in the mid-1960s). That has fundamentally tilted the economy: in the past 10 years, the ratio of retired to working Italians has jumped from 23% to 28% — the second highest in the world — clipping productivity and jeopardizing the solvency of the pension system. Without an unexpected surge in births, that ratio is expected to double by 2040. Italy is hardly the only industrialized nation to face a demographic time bomb. But elsewhere in Western Europe, the declining birthrate tends to be caused by eager young people striking out on their own who are too focused on satisfying immediate ambitions to take on the burden of rearing children. In Italy, says Francesco Billari, 35, a demographer at Milan's Bocconi University, the empty cradles are the fruit of exactly the opposite phenomenon: an adolescence prolonged well into the 30s. Nowadays, the average Italian man is 33 when his first child is born, making Italian men the oldest first-time fathers in Europe. There are plenty of reasons: drawn-out university studies, inadequate child care and, frankly, not enough young adults willing to grow up. "Italians take a long time to assume responsibilities," Billari explains. "Everything," from moving out of the parental home to marrying and having kids, "starts late." A peculiarly Italian part of the problem is the stay-at-home son, or mammone. More than 80% of men aged 18-30 still live with their parents, enjoying the coddling of doting mamas who take care of all the boring details of daily life, leaving the son free to spend his time and his income on pleasing himself. Who'd want to give that up before he had to? Nowadays, the typical young Italian mammone has even become a figure of ridicule. Essentially what we are seeing is a society which is insufficently able to flexibilise institutionally (whether at the government, employment market, corporate or family levels) to be able to confront the problems posed by rapid ageing. 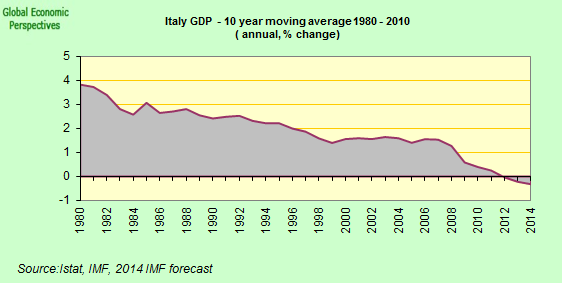 Italy - Lost in Stagnation? What is Italian Economy Watch? In Lira Or In Euros? France - Europe's New Sick Man? Eurozone - Continuing The Hike? Italian Elections: End of the Berlusconi Era? Addio, Dolce Vita, Or Twilight of the Idols?